When Nova Scotian companies are paired with experts from local universities, innovative things can happen. Take Copernicus Labs, for example. They’re an entertainment content and production company that teamed up with members of Dalhousie’s NeuroCognitive Imaging Lab to collaborate on a new video game that helps with second language learning. 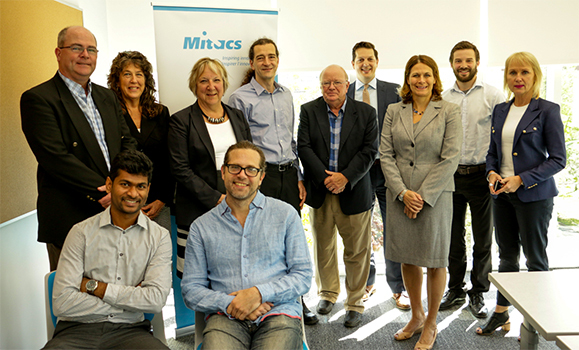 Last week, on June 1, reps from both the company and the lab, led by Dr. Aaron Newman, had opportunity to talk about their experience with Mitacs at a roundtable hosted by the organization. The discussion took place at Dalhousie’s Collaborative Health Education Building and included government officials, university representatives, students and business leaders. The focus was the importance of connecting Nova Scotia companies with universities for research internships and skills training in order to stimulate the economy, create job growth, and attract and retain skilled workers in the province. From Rosetta Stone to Babbel, there are many apps available to help with learning a new language. Most of these apps are point and click based and use a “passive learning” technique, where the user hears and sees words, but doesn’t do a lot of speaking. Copernicus Labs wanted to try something different — something that engaged the user and provided feedback on how they are doing. A couple of years ago, the company approached Dr. Newman, Associate professor with Dalhousie’s Department of Psychology and Neuroscience, and his team about becoming involved with the development of LANGA (LANguage GAming). LANGA combines broadcast quality animation, highly playable games and advanced speech recognition to create a unique and engaging online learning experience. Dr. Newman and and his team have been helping with the design of the learning materials, testing prototypes to assess the effectiveness of the language training, and using neuroimaging to visualize the brain areas and processes engaged during learning. The project initially began with the help of an NSERC Engage grant. This allowed for the development of a working prototype of LANGA and supported the work being done in the lab to test the prototype. Once the project reached a certain level, the team realized they needed to increase the number of highly qualified personnel involved. This is where Mitacs comes into the picture. Mitacs is a national not-for-profit organization that has designed and delivered research and training programs in Canada for 16 years. Brennan Gillis, who works in business development with Mitacs, had initially approached Dr. Newman about collaborating on another project. After hearing about LANGA, he thought it would be a great candidate for the Mitacs Accelerate program. The Accelerate program connects graduate students with industry partners for research internships supervised by faculty. Through this program, Mitacs has supported four interns on the LANGA project. They have backgrounds in linguistics, cognitive neuroscience and computer science and will be conducting the additional research and development needed to make LANGA more comprehensive, effective and market-ready. Brennan agrees. "This was another great win for Nova Scotia. We were able to support Copernicus' research needs and provide a great experience to a graduate student. The experience resulted in Sreejith Gopalakrishnan [a former Mitacs intern and graduate from Dalhousie’s computer science program] joining the company. It's an example of business and university actually driving innovation and creating opportunity in the province." The plan is to release LANGA in the next year with some smaller apps for kids and some teasers for the adult version. Last week’s roundtable included Dr. Newman, Sreejith and Juan Cruz Baldassarre, (CEO, Copernicus Labs). It was an opportunity to showcase the large amount of research and development taking place in our local universities and colleges, the impact it is having nationally and the role Mitacs plays. Dr. Newman is also thrilled with his experience working with Mitacs, and has plans to continue partnering with them in the future.